A 1.6 MW Caterpillar 3520 generator uses methane gas from the Denton Landfill to generate power while a backup candlestick flare located on the landfill property combusts landfill gas when the generator is at capacity. The project has annual emissions reduction of 52,000 metric tons CO2e. Located in Webster Township, WI this dairy is home to 900 dairy cows, and an on-site anaerobic digester. 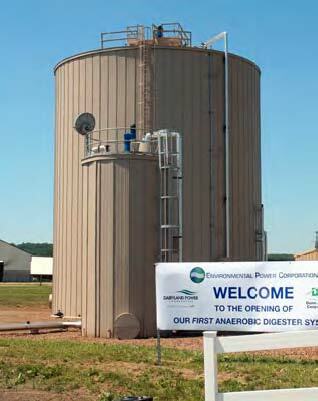 The digester creates methane-rich biogas from their waste, which is used to generate 750 kilowatts of electricity per hour. That electricity then feeds into the local power cooperative supporting clean energy for the community. Located in Rice Lake, WI, Norswiss Farms is a 1,100 cow dairy farm operating an anaerobic digester. The system is driven by a Jenbacher JGS316 GS-BL biogas engine with JW/IC heat recovery to maintain the temperature of the digester tank. The system operates 24/7 and exports all of the generated electricity to the grid. This system will annually generate over 6,500,000 kWh. An 800-head dairy farm owned by Lee Jensen, Five Star Dairy operates an anaerobic digester fed by over 26,000 gallons of manure per day. The digester includes an engine generator set using the biogas to generate up to 775 kW of electricity, enough power to supply 600 homes. The Decatur-Morgan County Landfill is a municipally-owned site with a 10 million ton waste capacity. The landfill site is approximately 270 acres and has operated since 1981, but prior to this project never had a comprehensive gas collection system in place. Through this project, methane emissions from the Decatur landfill are collected and piped to a near by steel plant where they are flared as a heat source in the steel production. The Davis County Landfill is operated by Wasatch Integrated Waste Management District. Through this project, methane emissions from the Decatur landfill are collected and piped to a third party and used for generation of electricity on the adjacent Hill Air Force Base. Located in Chengshan Town, Rongcheng City, Shandong Province, People’s Republic of China, the Chengshan Wind Power project delivers zero-emissions renewable electricity to China’s North China Power Grid. The project is validated and verified to the Verified Carbon Standard (VCS) and has also registered and issued credits with the Clean Development Mechanism (CDM). The wood biomass fired steam plant in Wiggins is a biomass thermal energy project fueled with locally available forestry and agricultural cellulosic residues (i.e. logging residues, primary mill residues, and crop residues).